It's October, which means it's time for all things spooky and kookie. In that spirit, the Fandom Foodies group theme for the month is #Burtoween! Carrie at Witchy Kitchen is our host and she has invited everybody to participate in this spooktacular feast by creating recipes pulled from or inspired by Tim Burton films. Whether he wrote, directed, produced, or did the art work—they are fair game! For more info on how to participate, visit #Burtoween at Witchy Kitchen! I'd been meaning to do a dish inspired by Edward Scissorhands for months, so this was the perfect opportunity for me to cross that off my list! I didn't go creepy (I know, boring), but who could resist the allure of a retro dish that is somewhat quirky? Not I. When kind local Avon saleswoman finds a boy with scissors for hands hiding in a castle after the death of his scientist (father) creator, she brings him home with her. The neighborhood circuit of nosy, desperate housewives goes wild with this development, "encouraging" Peg to have a barbecue to introduce Edward. 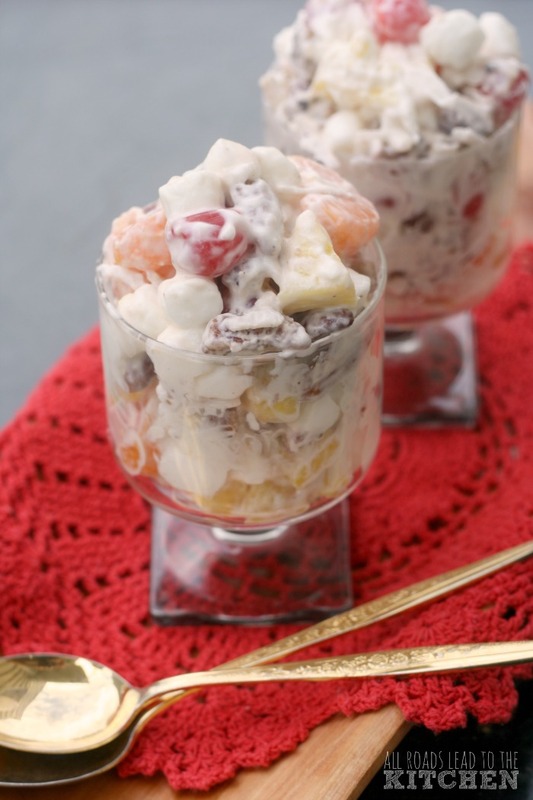 But, when the most desperate and ridiculous woman of them all, Joyce, shoves a giant spoonful of her famous ambrosia salad in Edward's mouth, I can't help but get a craving. Hers is a dull pink color and doesn't have much texture...which could actually be construed as scary...but my interpretation uses fresh ingredients instead of canned (and I pat the cherries dry to ward off that pink tint). 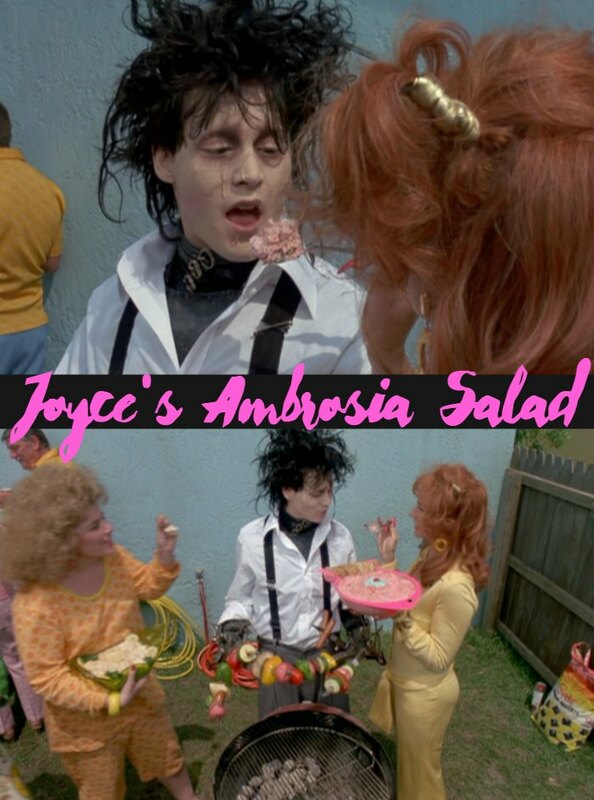 I suppose Joyce's ambrosia is as much about the delivery as it is about the actual dish. Poor naive Edward is used and abused by most of the people he meets, but he leaves his mark on the hearts of everyone he meets. This modern version of a retro dish does the same. 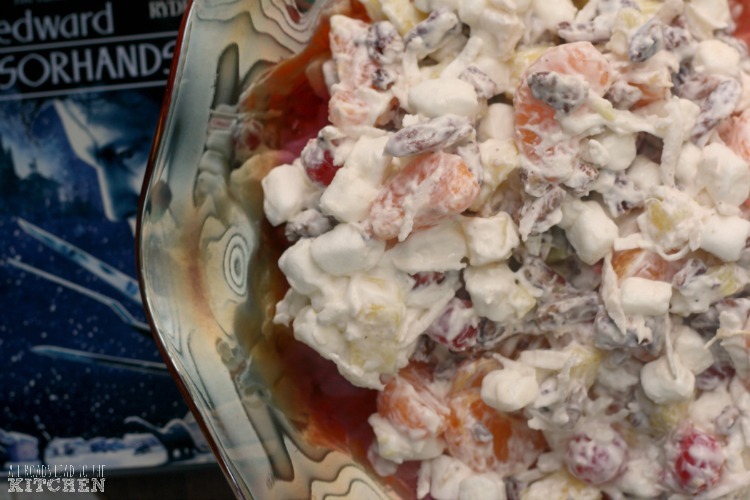 I will have another #Burtoween recipe later this month, which will also be my Food 'n Flix Beetlejuice entry! You might also like my Corn Dodgers with Maple Apples & Jowl Bacon recipe, which was inspired by Abraham Lincoln: Vampire Hunter (produced by Tim Burton) or my Alice in Wonderland (directed by Tim Burton) inspired Bandersnatch Drool recipe. Be sure to follow #Burtoween on social media for more fun posts all month long! 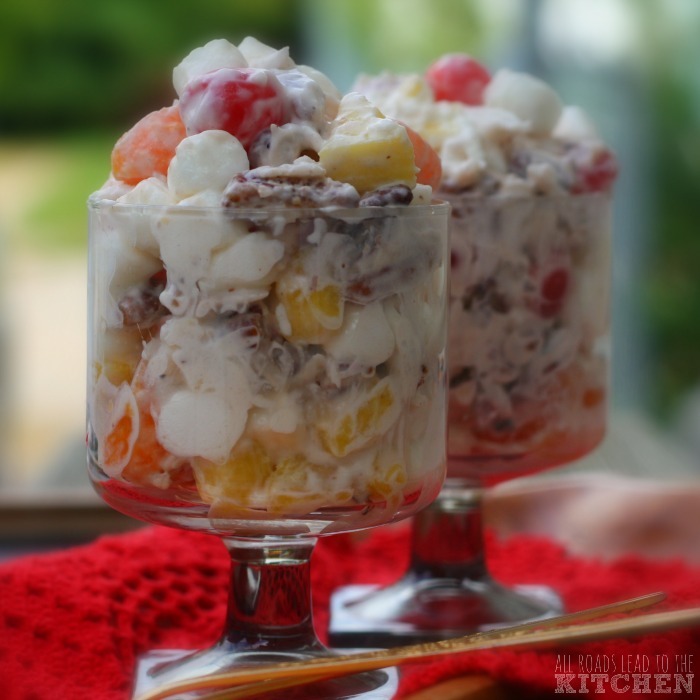 This retro dessert is updated with fresh clementines, pineapple and coconut with maraschino cherries, marshmallows, and toasted nuts folded into a whipped cream and sour cream mixture. Combine cream and powdered sugar and whip until stiff peaks form; gently whisk in the sour cream. 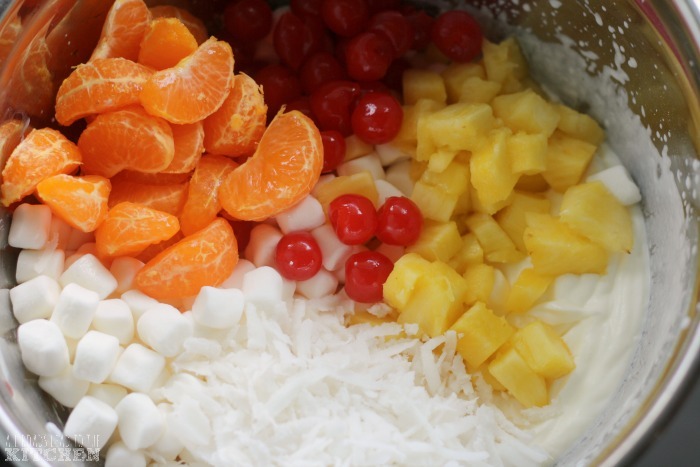 Fold in the marshmallows, orange, pineapple, coconut, pecans and cherries. Transfer to a serving bowl; cover and place in the refrigerator for 2 hours before serving.